Pride Pursuit heavy-duty 4-wheel scooter combines rugged construction with great looks. The Pursuit® incorporates a blend of power, style and performance to handle rugged outdoor terrain. With an active lifestyle in mind, the powerful drivetrain, 24 Volt, 4-pole motor for increased power, 3.56” ground clearance and maximum speed of 8 mph combine power and torque to accelerate your outdoor experience. 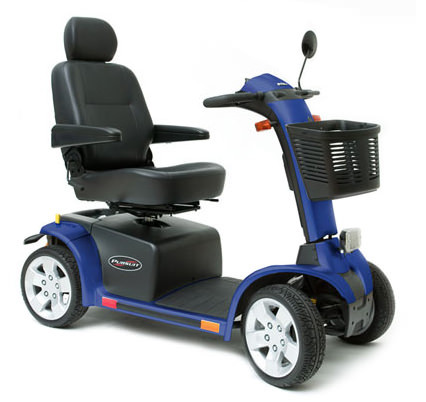 Standard features include feather touch disassembly, wraparound delta tiller, 13” low-profile solid tires, front and rear suspension, high-back reclining seat, full lighting package that includes directional signals and large lower headlight for pathway illumination, infinitely-adjustable tiller, front basket and rearview mirror. Overall Width of Base** 25.25"
Seat-to-Deck Height Range 17" - 18.75"
3 Year Limited Warranty: Main Frame, Fork, Seat Post, Tiller Frame. 1 Year Limited Warranty: Bearings, Bushings, Rubber Components, Plastic components, Electronic Controllers, Chargers, Harnesses. The manufacturer will not warrant parts damaged by improper installation and/or repair on the part of the individual owner or normal wear & tear. The manufacturer does not warrant parts damaged by neglect, accident or misuse, nor parts altered or serviced by an agency not authorized by the manufacturer.